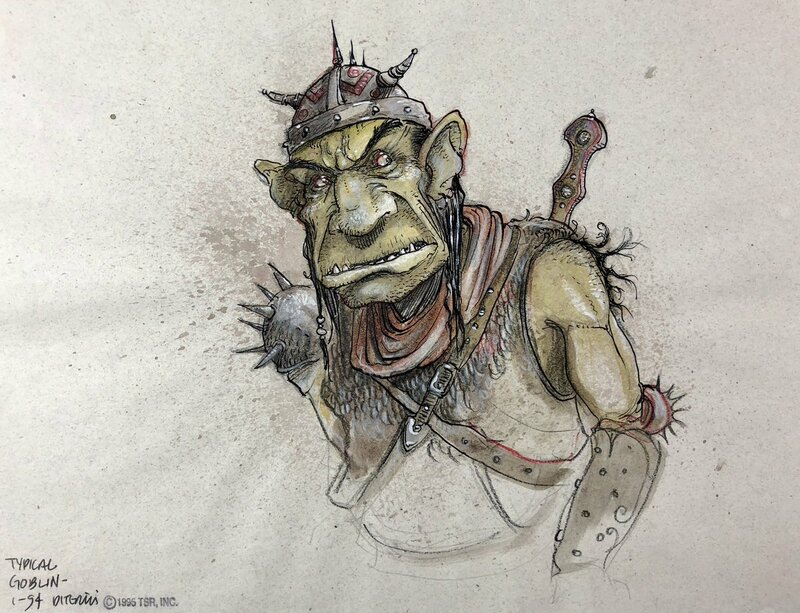 Renowned artist Tony DiTerlizzi took to Twitter to look back at some of his original Planescape sketches and art. Each image below is a link to a single tweet containing 3-4 images. Click on each to see them all! "It’s hard to believe D&D’s “Planescape” is 25 years old. I don’t have many preliminary sketches as the tight deadlines had me going straight to final art. It was an exhilarating time in my career. My energy and enthusiasm knew no bounds." "More developmental sketches from the D&D “Planescape” campaign boxed set 1993-94:"
"In the fall of 1993, I’d been sent a pile of copies of Dana Knutson’s concepts to work from. Sadly none can be found in my files, though I do have this early (perhaps first) drawing of a tiefling." "...and here are several more. Some of these “flavor sketches” (like the Skeksis-ripoff) were ultimately published to fill spaces in the booklets." "The 25th Anniversary of D&D’s “Planescape” continues with more preliminary sketches and the start of finished illustrations. You can see how the sketches developed into finished pen & ink drawings." "Also seen are more of Dana Knutson’s concepts (from “The Planescape Sketchbook”) and photo reference of my bride-to-be." "...and some original art from 1983’s “AD&D Monster Manual II” showing the original design of the Modrons alongside my 1994 reinterpretation. I’m delighted to see these weird little guys are a part of 5th edition." "Lastly, Interior art—including some of the two-color art, which remained tricky to print throughout production. I’ve tried to find pieces that were not printed in [Dark Horse Comics] “Realms: The RPG Art of Tony DiTerlizzi”, which collects many of my finished Planescape pieces." Well this is a clear indication that we are finally getting a Spelljammer setting this year! Take that, Crawford!! Athough we never really got to play planescape I owned the box and I really loved the art. Big fan of the PS art and style! I've always enjoyed DiTerlizzi's style. I feel so lucky to have been able to go to one of his book signings! The art is one thing that TSR really did well. Tony DiTerlizzi really helped to define Planescape the same way that Brom defined Darksun. Probably one of my favourite artists. I bought his book realms last year which contains a lot of his planescape artwork in it. He really did help set the tone for planescape to the point now where it is hard to think of planescape without thinking of his artwork. Where do you read that? This is PLANESCAPE art. DiTerlizzi had nothing to do with Spelljammer. And crawford and cohort have clearly specified that there will be no Spelljammer this year? Lovely stuff! More odd settings to the people! Four of Tony's signed Planescape prints occupy prominent spots in my gaming room. Would love to see WotC bring him back for work in future planar books. Planescape was awesome, although I absolutely did NOT like his art for Planescape. My DM likes to torment me with it and has recently done so with our playthrough of Dungeon of the Mad Mage. Awesome stuff to see. Planescape was a setting I wanted to run back in the day but never got the opportunity. Also, still mad about the Spiderwick Chronicles movie. Still mad? Did you not like it? It had its moments, but also its flaws. It took the approach of the books, which was very much grounded in folklore, and replaced it with…with…with things like spraying faeries with ketchup! Fair enough. That might be why I enjoyed the movie, I've skimmed through them looking at the artwork but never actually read them so didn't have any prior knowledge getting in the way of watching the movie. I always loved Planescape, probably one of my favourite settings. It is Diterlizzi who made Modrons well known (the 1983 artwork of them is horrible) and the various mechanical parts and lenses have become the staple for them since then. Hard to believe we had to wait until last year to finally get miniatures of them, but now we have the Monodrone, Duodone, Quadrone and Pentadrone out as Icons of the Realms minis finally!